Protection/relief of symptoms - Germ/Bacteria fighter acts overnight. Throat, cough, aches and pains associated with flu. Relieves symptoms overnight when taken early in the infection. Attacks & kills germs,viruses. and bacteria Use directly into the nasal areas and take orally at the first sign of infection. 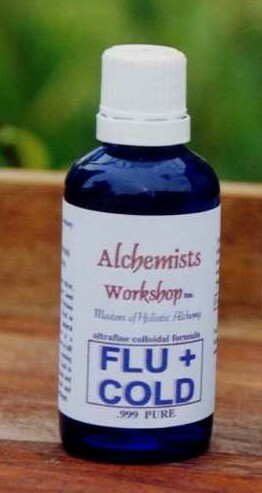 One of the few solutions that can head off a bad attack of flu or head cold. If taken well into the infection, this colloidal formula will reduce painful and annoying symptoms and speed up recovery. This solution attacks the cause not mask the symptoms. Unique non-drug Ultrafine Colloidal Formula to help protect against, and destroy flu infections. Very effective when used at the first signs of infection. A few drops into the nasal passages plus a half teaspoon held under the tongue before allowing it to trickle down the throat twice a day for two days then once a day if needed. Can also be used as a gargle for sore throats. Usually overnight effective. After seven years of making this colloidal formula, by popular demand we are now making it available in 100ml. bottles with special pricing for 100ml and Economy 200ml. (2x 100ml bottles) prices. Also now available as 200ml. with SAVINGS. see drop-down menu below. AutoImmunity - The New ALL 100% Colloidal Immune Booster targeted at restarting your immunity.